What if we could look at the entire history of humanity at once? Pantheon aims to create a data-driven view of history by collecting, visualizing, and analyzing data on the biographies of historical characters. We are particularly interested in what this data can teach us about the production of knowledge across history, the relation between accomplishment and fame, and information wanes from history. 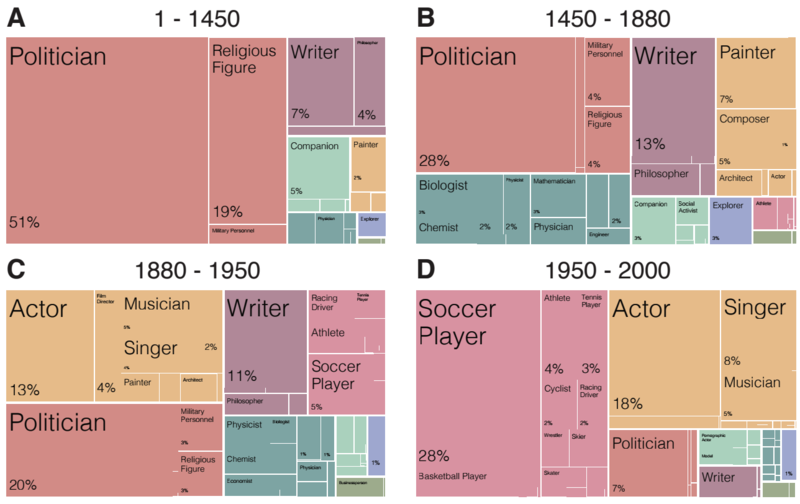 The first thing we notice when we explore the data is that the occupations of these historical characters change according to the year they were born. People born before the printing press (1450) were more likely to be a politician or a religious leader than people born after the printing press. Communication technologies, from printing to social media, affect our historical records by changing the way ideas are spread and recorded. Yet, finding statistical instruments to address the endogeneity of this relationship has been problematic. Here we use a city's distance to Mainz as an instrument for the introduction of the printing press in European cities, together with data on nearly 50 thousand biographies, to show that cities that adopted printing earlier were more likely to be the birthplace of a famous scientist or artist in the years after the introduction of printing. At the global scale, we find that the introduction of printing is associated with a significant and discontinuous increase in the number of biographies available from people born after the introduction of printing. We bring these findings to more recent communication technologies by showing that the number of radios and televisions in a country correlates with the number of performing artists and sports players from that country that reached global fame, even after controlling for GDP, population, and including country and year fixed effects. These findings support the hypothesis that the introduction of communication technologies shift historical records in the direction of the content that is best suited for each technology.